Does it cost anything to attend the Spainwise Jobs Fair? No. Attendance at the fair, the workshops, the presentations, the CV-Forwarding service, etc. is ALL FREE. Is Bilbao easy to get to? Bilbao is one of the easiest locations in Spain to reach, with an international airport and another within an hour’s bus journey (in Santander). With Spain’s Bus services, getting to the fair from any nearby location couldn’t be easier. Will I be able to find accommodation in Bilbao if I just show up on the day/night before? There are always a lot of trade fairs so accommodation can be difficult if you haven’t planned ahead but there are usually a variety of reasonably prices options available. Why should I attend the fair? There are over 6,000 private language schools in Spain so teachers often don’t know where to start looking! The Spainwise Fair provides a unique opportunity for teachers to meet with some of the top schools in the country. Although some private language schools in Spain may be willing to recruit via the internet and/or phone/Skype interviews (the job-seeker’s equivalent of a blind date! 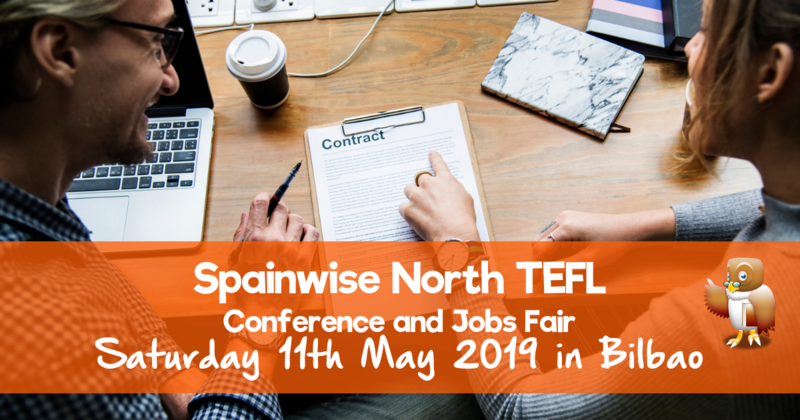 ), most discerning teachers appreciate the unique opportunity to meet employers face-to-face which the Spainwise Jobs Fair offers. Where else would you find so many private language schools under one roof? The seminars and presentations are also a great way of finding out more about the private language teaching sector. They provide teachers with essential background information to enable them to make more informed choices when considering employment opportunities. Rather than taking along multiple copies of your CV, you can upload your CV to Spainwise’s online database. All employers taking part in the fair will have access to the CVs in this database on the day of the fair. What do teachers who have attended the fair have to say about their experiences? You can read some immediate reactions from teachers here or more detailed descriptions of how they got on here. What do you do if an interviewer asks a question and you don´t know the answer? Be honest! Interviewers will appreciate your honesty far more than a load of spluttering and contrived waffle! Should I be prepared to do an interview on the spot? Yes. Most employers at the fair conduct on-the-spot interviews. Obviously, because of time and space constraints, these ‘mini interviews’ are not as in-depth as a normal job interview, but many employers shortlist teachers at the fair and conduct follow-up interviews with candidates afterwards. If I´m not a native speaker, will I still have a chance of finding a job? Spainwise actively discourages employers from discriminating against non-native teachers. The individual requirements of each school are different. Do your research BEFORE you come to the fair and check out each participating school’s requiremenst by clicking on their logos here. Will schools help me find accommodation? Most schools will help new teachers to find accommodation. It’s a question you should ask individual schools you interview with. Do schools sort out taxes and health care? Once you sign a contract with a school, you will be paid monthly and given a monthly pay-slip (called a nómina in Spanish: more detailed informationhere). Tax is deducted at source so schools are directly involved in tax deduction. As a contributor to social security, you will also be entitled to free state health care. You will have to register separately for this and most schools will help you with this. Are there free sandwiches and tea at the Spainwise fairs? No. Attendance at the fair, the workshops, the presentations, the CV-Forwarding service, etc. is ALL FREE. But there are no free refreshments.